When I was growing up, we sometimes would have chicken cordon bleu as a special treat. We bought the frozen variety from the Schwann’s delivery truck. 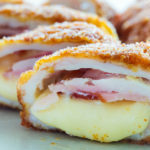 Delicious Air Fryer Chicken Cordon Bleu – filled with ham and cheese. I loved when the Schwann’s truck drove down the road. I would just hope and pray that he would make a stop and knock on our door when my Mom was home. For one, we were sure to get another gallon of ice cream. And if it was the right season, they carried my favorite flavor – Peppermint! Then there was the quick and easy lunch sandwiches that my Mom would buy. I can specifically remember the Ranchero sandwich that resembled ham and cheese on a croissant. You must first butterfly the chicken – cut lengthwise until you reach the last 1/2 inch. Just pop it in the microwave and a ‘hot’ meal was served! It was a busy teenager’s dream! But best of all, we would always get frozen packets of individually wrapped chicken cordon bleu. So whenever we had little time to prepare dinner, we would put them in the oven to bake while the other chores got completed. About 50 minutes later, a hands free dinner was on the table. So what exactly is Chicken Cordon Bleu? It’s a French dish that involves meat that is wrapped around ham and cheese. Typically and most often, Swiss cheese. It’s important to pound out the chicken breast until the same thickness throughout. Obviously chicken cordon bleu uses chicken as the base. However it can also be made with pork and veal cutlets. It is rolled and then coated in breadcrumbs and fried or baked. 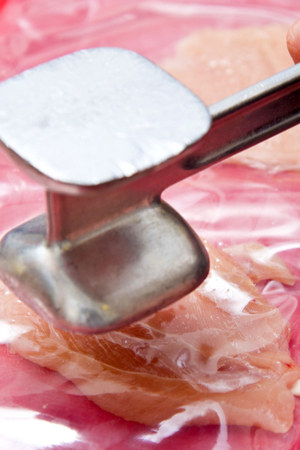 Once sliced, the cheese that has melted perfectly inside flows over the ham. 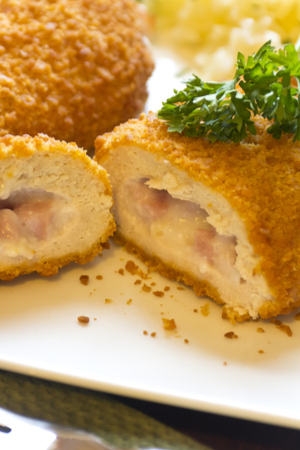 Chicken, ham, Swiss cheese all rolled up and breaded into a decadent main dish. Serve it with a creamy mustard sauce and you have a meal that looks like it was served from the finest chef! I first thought of making air fryer chicken cordon bleu as I was walking through the grocery store freezer aisle. Layer Dijon mustard, cheese, ham and another layer of cheese. I was just passing through to get to the front of the store and happened to see a big sale on the frozen packages. My mind went right down memory lane and the craving for this dish began. I was beginning to expand on recipes that I used in my BCP 5.5 quart air fryer. I had made chicken wings, hamburgers, and chimichangas. And now I was insistent that I would satisfy my craving and make Air fryer chicken cordon bleu. However, as an adult, I realize that most pre-packaged meals are not the healthiest choice. The sodium content alone takes up most of the recommended daily amount. And the amount of added preservatives had me questioning whether I should really purchase this product. Dredge in flour, egg and a Panko Parmesan cheese to make that beautiful crust. But I knew it would be so easy to cook it in the air fryer. Instead, I decided to take the healthier route and make homemade air fryer chicken cordon bleu. I have always been hesitant to make chicken cordon bleu. It looked so complicated between the stuffing and breading. But the craving was too strong. I knew I had to at least try to make it myself. Spritz the outer coat with a light mist of grapeseed oil to prevent sticking. So I pulled out the chicken breast and went to work. I have often cut chicken breasts in half lengthwise in order to cook them more evenly. The only thing that I had to do differently is to not cut them completely through. In order to do this, I placed my left (non-dominant) hand firmly on top of a chicken breast that sat on top of a cutting board. I then pressed down as I sliced through the middle, being sure to stop before I sliced through to the other side. Then I opened it up like a book and began to flatten it out with a meat mallet. The next steps were easy. 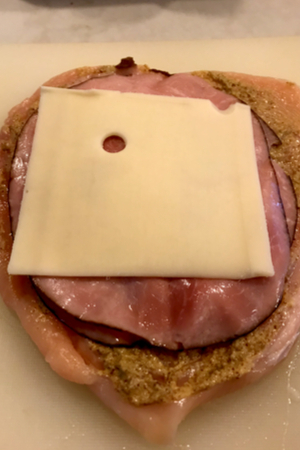 Spread Dijon mustard over the top and layer cheese and ham on top. 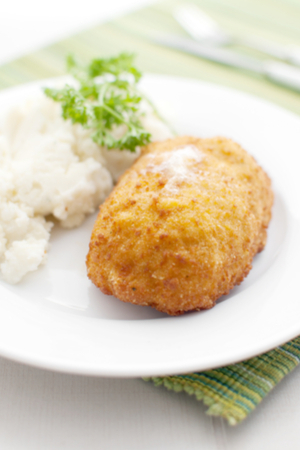 Air Fryer Chicken Cordon Bleu – healthier than the store-bought version. The rolling process is next. Start at the long end of the chicken breast and begin to roll the ingredients together. Once rolled, secure with toothpicks. All that is left is to dredge in the coating and bake in the air fryer! 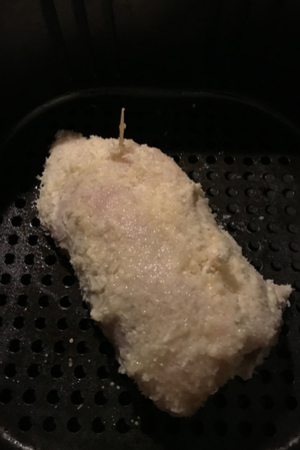 And the result – AMAZING Air Fryer Chicken Cordon Bleu that is healthier and more delicious than store-bought. 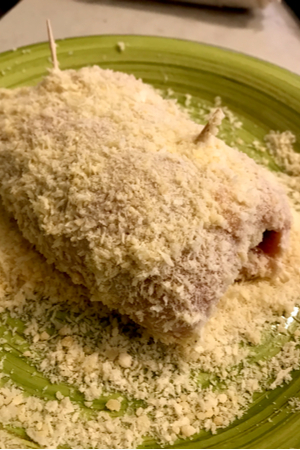 Chicken breasts filled with ham and swiss cheese and coated in a breadcrumb and Parmesan cheese mixture, then air fried to a crispy golden brown. Place the chicken breast on a cutting board and press down on the long side of the chicken breast with the palm of your non-dominant hand. 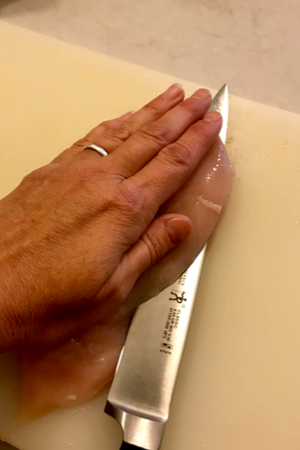 While pushing down on the breast with your hand, cut through lengthwise until you are ½ inch from the other side. Open the chicken breast up like a book. Place a piece of plastic wrap over the chicken breast and gently pound it with a meat tenderizer, make it the same thickness throughout. Season the chicken with salt and pepper and then spread Dijon mustard on pounded surface of each chicken breast. Place one slice of cheese on top of the mustard, then top with the 2 slices of ham and the other slice of cheese. Starting with the long edge of the chicken breast, roll the chicken up to the other side, tucking each layer in as you roll. Secure with toothpicks. Set up a dredging station with three shallow dishes. Place the flour in one. Place the beaten egg in the second dish. Combine the panko breadcrumbs and Parmesan cheese together in the third one. Dip the stuffed and rolled chicken breasts in the flour, then the beaten egg and then roll in the breadcrumbs-cheese mixture to cover on all sides. Press the crumbs secure against the chicken breast to make sure they don’t fall off. Spray the chicken breasts with grapeseed oil and let sit for 5 minutes before transfering to the air fryer basket. Air-fry at 350°F for 16 minutes, flipping the breasts over halfway through the cooking time. Let the chicken rest for a few minutes before serving.